Ozanam House Senior Youth Group news and information. 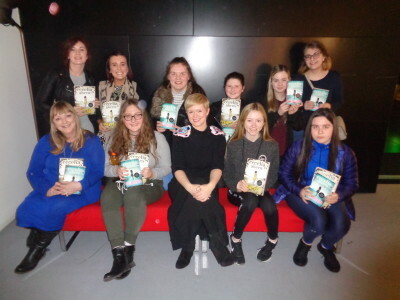 This week our senior youth service members were invited to the launch of Cecelia Ahern’s new book “perfect ” in the lighthouse cinema in Smithfield. The kind invitation to the event had been sent through our reader in residence Bernadette Larkin. The interview with Cecelia really inspired our young people to read and even write their own novels in the future ! She gave fantastic tips on how to get the creative stream flowing and helpful tips on how to survive the world of book writing ! All our members received copies of the new book and second in the series , “Prefect”. In order to fully grasp the new book they were also given copies of the first book in the series “Flawed”. Cecelia provided some inspiration for all our members and took time to sign each book and answer questions they had about her success and how she achieved it. A “perfect” night was had by all. Group 2 will be having a beach day, leaving at 10am. Returning at 4.30pm. Group 1 are going to the Hard Target Defence Workshop. Meeting in Ozanam House Sports Hall at 9.45am. Should be finished at 3pm. Group 2 are going Boxing at the Aviva. Departing 11.15am, and returning at 3.30pm. Group 2 will be heading off to Kilkenny Activity Centre, leaving a little earlier than usual at 9.45am. Returning at 4.30pm. Group 2 are going Banana Boating and BBQ. Lets hope there is plenty of sunshine! Group 1 are going to Summerhill in Co. Meath to go banana boating. We will have a BBQ while we are there. Group 2 are taking a hike in the Dublin mountains and visiting the Hellfire Club. Group 2 are going to Skirmish paint-balling!